— The only known pieces of the moon to be collected from the lunar surface and be legally sold are returning to the auction block, 25 years after they were first offered. The three tiny lunar pebbles, which were among a small cache of moon material brought back to Earth by a Soviet robotic probe in 1970, will headline Sotheby's space exploration-themed auction on Nov. 29 in New York City. The same moon rocks were previously sold by Sotheby's for $442,500. "The sale of this item is exciting for me because I remember when the rocks first came up in 1993 and it was a huge deal," said Cassandra Hatton, vice president and senior specialist for science and technology at Sotheby's. "To have the opportunity to be involved with offering the same item again is really tremendous." The lunar samples were originally presented by the Soviet government to Nina Ivanovna Koroleva, the widow of Sergei Korolev, the "Chief Designer" of the Russian space program. Under Korolev's direction, the Soviet Union successfully put the world's first satellite into Earth orbit and launched the first human into space. His unexpected death in 1966 came before he could see the outcome of the space race to the moon. Four years after Korolev died, the Soviets launched Luna 16, the first of three robotic lunar sample return missions. Touching down after the U.S. Apollo 11 and Apollo 12 astronauts had come and gone from the moon, Luna 16 deployed an extendable arm to drill and extract a core sample 14 inches (35 centimeters) deep. The 3.5 ounces (101 grams) of soil and rocks that it collected were then deposited into a capsule for their return to Earth. The display gifted to Koroleva contains three grains of the Luna 16 material, weighing about 0.0007 ounces (0.2 grams). The central fragment is basalt, typical of the moon's mare (or "seas") terrain while the adjoining two larger fragments are regolith with glass coatings caused by an micrometeoroid impact, according to Sotheby's. The pebbles are presented under glass with an integrated lens for magnified viewing. 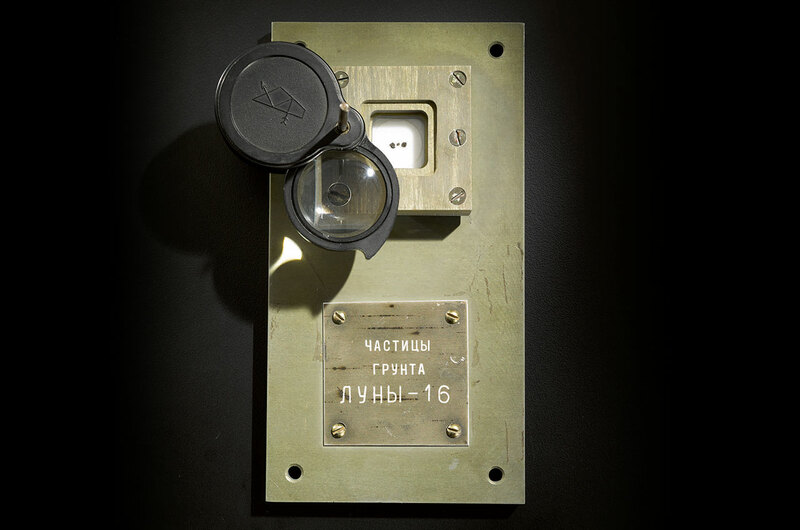 A plaque attached to the display reads "Soil Particles From Luna-16" in Russian ("ЧАСТИЦЫ ГРУНТА ЛУНЫ-16"). In 1993, the lunar samples were estimated to sell for $30,000 to $50,000 before commanding eight times the higher valuation. The display, which has been held in the same private American collection for the past quarter century, is now expected to sell for $700,000 to $1 million. The Luna 16 moon rocks would need to surpass $1.8 million to break the record for the most ever paid for a space exploration artifact, currently held by a moon dust-stained lunar sample return pouch sold by Sotheby's in 2017. "There are only a handful of items in this collecting field that I think are so rare — the Apollo 11 bag, for example, being one — that being able to offer real lunar material at auction is the ultimate peak for selling in this category. So I am thrilled to be able to offer it again," Hatton told collectSPACE. The Soviet Union's Luna 16, Luna 20 and Luna 24 probes retrieved 0.7 pounds (0.3 kilograms) of lunar material. By comparison, NASA's six Apollo missions to land on the moon returned a total of 842 pounds (382 kilograms) of moon rocks, soil (regolith) and dust. Unlike the Russians, the U.S. has never gifted any individual with Apollo-collected moon rock. The only lunar samples relinquished from U.S. federal property were two sets of public goodwill presentations to 135 foreign nations and the 50 states. It is unclear how many, if any, additional Luna 16 sample displays were presented (a photo of a purported example, differing in style, has surfaced online), but the Koroleva example remains the only one to have clear legal title for sale. It will be on public exhibit at Sotheby's New York City gallery beginning Nov. 25.